When enriching a country house, it’s worth considering every detail so that you have a good place to rest as a result. For example, when organizing a recreation area is to build a shed. 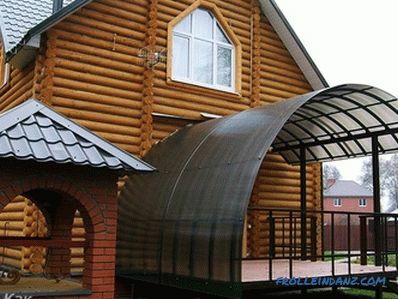 Polycarbonate can be used for this purpose. 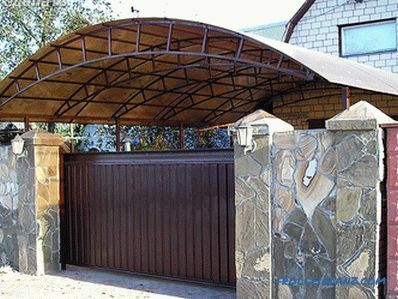 This material has sufficient strength, so you should know some details of the construction of the building from it. 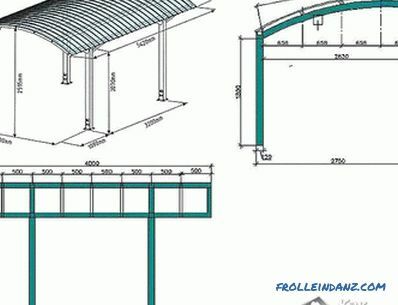 In this article, you can familiarize yourself with step by step instructions on how to make a polycarbonate shed. 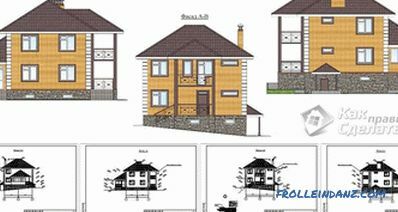 You can also view several drawings, which offer options for arranging this design. 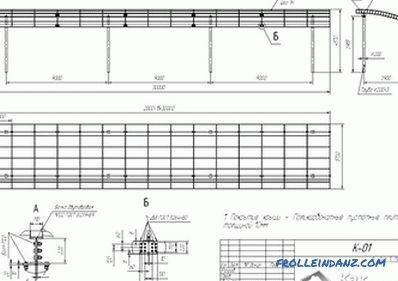 Therefore, even if you are new to construction, this article will help you get a general idea of ​​the work, as well as try your hand. 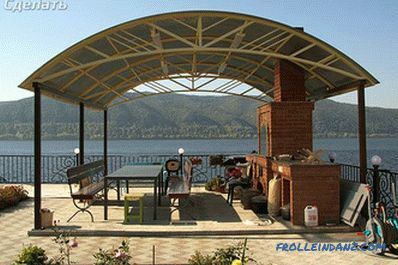 For the manufacture of transparent roofs, polycarbonate has recommended itself from the positive side. Unlike glass and plastic, this material is easy to use. 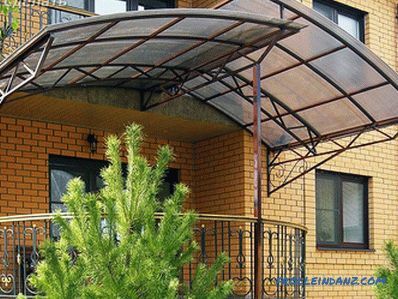 The edges of the product are equipped with stiffeners, so that sheets can be bent without bad consequences. 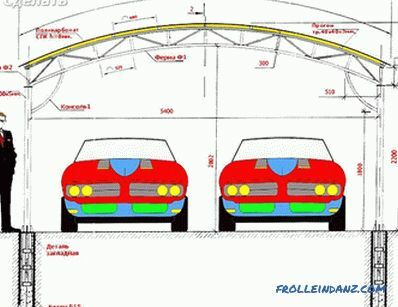 Therefore, it is possible to construct canopies of any planes, even semicircular. Another advantage of the material in a variety of colors. Plus, the transparency of the material enhances the lighting of the area to be closed. Sheets with a particular shade muffle the sun's rays. 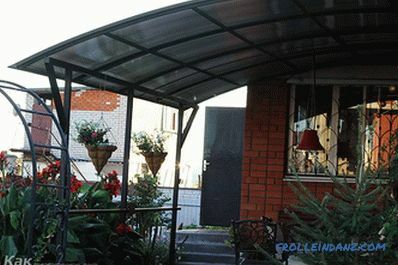 So even in the hottest weather, it will be safe to stay under a canopy made of polycarbonate. 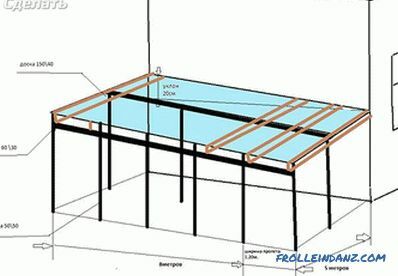 Measurement of the site and calculation of the frame. Determining the type of material for the frame. It can be metal or wood. 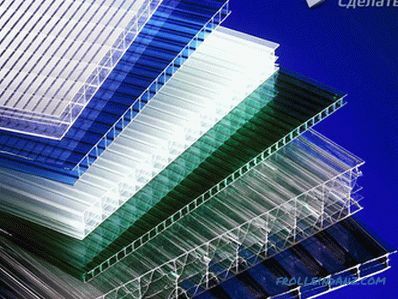 The definition with the type of polycarbonate is monolithic or cellular. 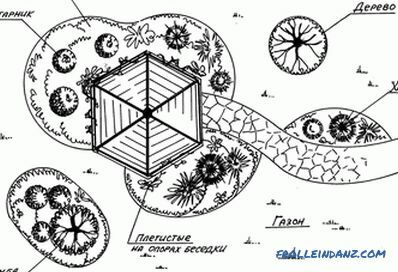 As for the drawings, at the end of the article, you can familiarize yourself with some of the options. For example, some can be taken as a basis and add something of your own. welding machine in case of metal assembly one frame. 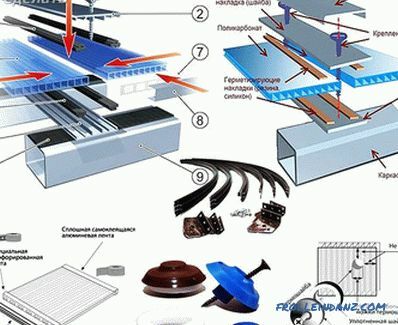 If the entire material / tool is assembled, you can proceed to the first preparatory stage. 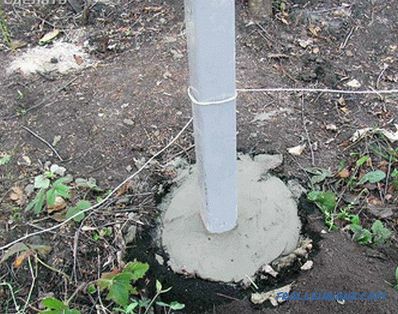 To install the supports, it is necessary to dig a hole up to 600 mm deep. 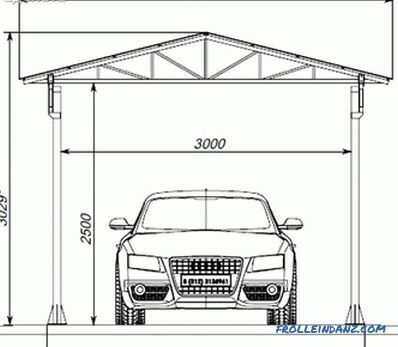 This is in case the canopy is planned to build a large one. The pillars of the support should be located at a distance of 1-1.5 m. Having done this work, the further frame can be fixed to the supports. 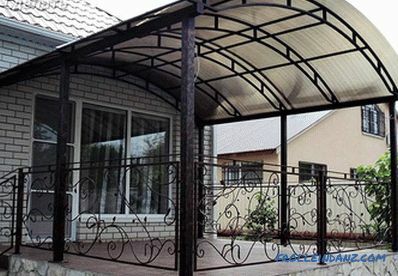 If the canopy is made small and is planned to be installed above the porch, then you may not need support. It will be enough a few anchor fasteners to the wall. As mentioned above, the frame can be made from wood or from a metal profile. The choice depends on the required strength of the final product. 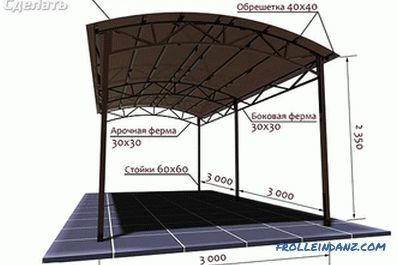 For example, if the canopy is made for picnic and rest, then you can build a frame from a bar. 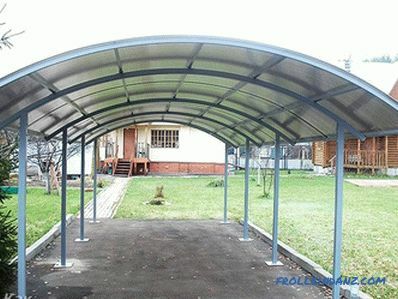 If you need a shelter for the car, it is preferable to make a reliable frame made of metal. In the latter case, the skills of the welder can not do. If you do not have those, you will need the help of a qualified welder. In order to save, you can purchase a finished frame that is assembled by bolts . This design, of course, will not be as strong as the welded frame, but in some cases the only right decision. 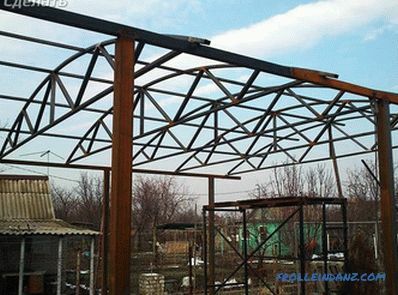 So, for the manufacture of such a framework, you will need a metal profile with a cross section of 60 * 60 mm or 100 * 100 mm. The choice of profile depends on the load. 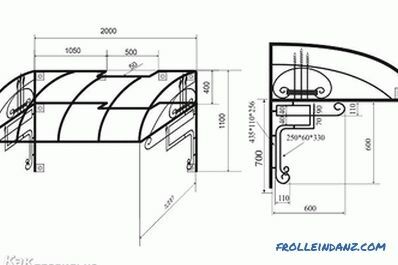 For example, for a run you can select a profile with a smaller cross section - 40 * 40 or 60 * 60 mm. 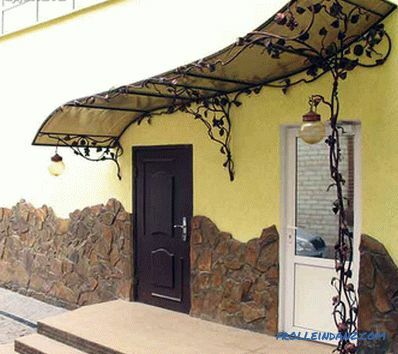 For the batten and less, you can use 20 * 20 mm. Previously concreted racks must first be tied at the top. This will provide greater rigidity to the structure. Additionally, the harness can be made from the bottom and in the middle. 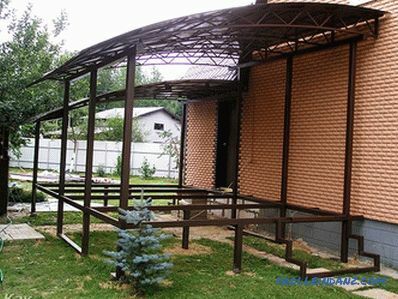 If the canopy is above the porch, then part of the supports will be on the wall, and the other part will be on the supporting pillars (in case the size is large enough). 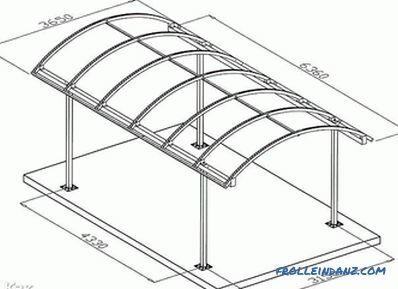 An arch is constructed for the upper part of the structure. 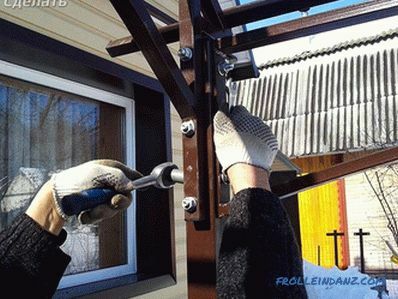 To make the bent elements, you need a pipe bender. 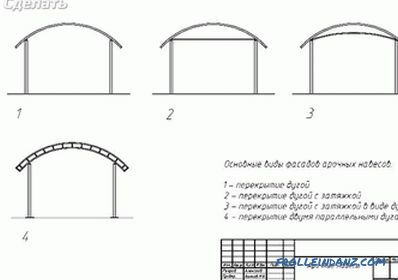 So, it will be possible to make an arch from a metal profile. 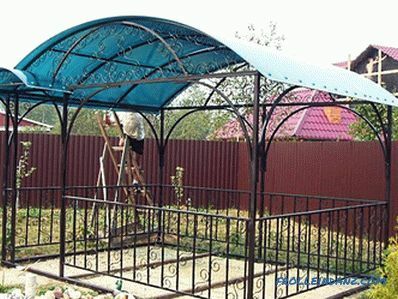 Already finished frame is covered with anti-corrosion composition, and then covered with the desired paint color. 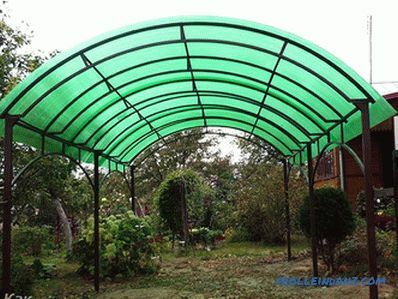 It should be noted, and some features of the attachment of polycarbonate to the frame. 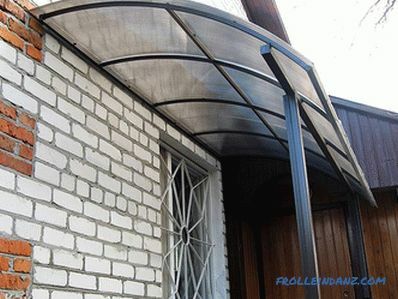 For the arch should purchase sheets with a thickness of 8 mm. 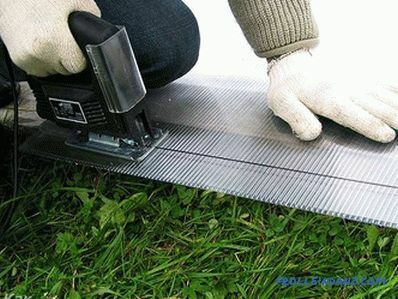 The more you should bend the sheet, the smaller should be its thickness. 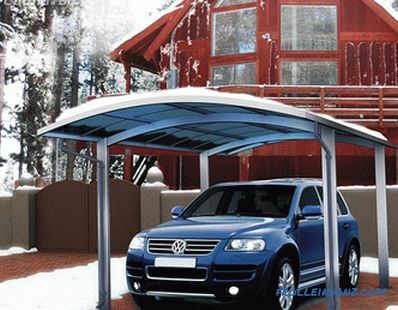 If the roof of the canopy is straight, then the coating sheets may be 10 mm thick. Individual blanks must be cut with a hacksaw or a circular saw. But consider when cutting, the length of the sheets should be such that the edges of the structure they looked at 100-150 mm. In the process of cutting can not be allowed to vibrate the product. This may cause cracks in the material. 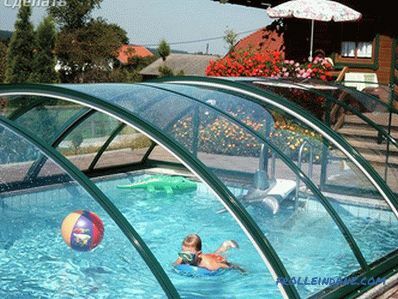 Some experts cut the polycarbonate directly in a protective film. Due to this, there is less risk of damage to the sheet during its preparation. Moreover, when laying the sheet, do not confuse the side. 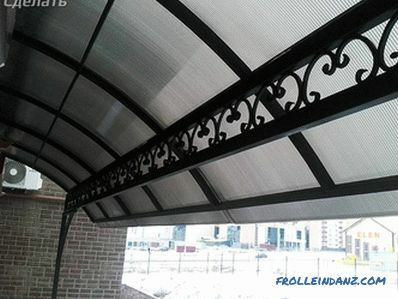 The side that has a protective film should be directed upwards, since it has UV protection. A joining profile is used to join the sheets. Before you twist the screw, pre-drill holes in the polycarbonate. They should be slightly larger than the diameter of the screw. Tighten the screws through special washers that have a rubber gasket. 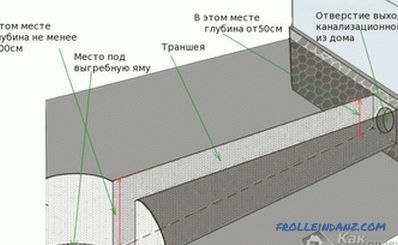 It is also important to organize a small gap in the joints of the sheets. It is enough to leave 3 mm to expand the material when heated. As for the end part of the sheet, it closes with an end profile. First, the supports are concreted into the ground. All wooden blanks must be treated with an anti-corrosion compound. Especially those that will be concreted. 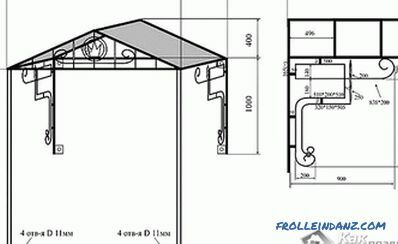 Attach brackets to the wall of the house, which will support two transverse beams 120 * 60 mm. For greater reliability, the bar can be fixed to the wall horizontally. 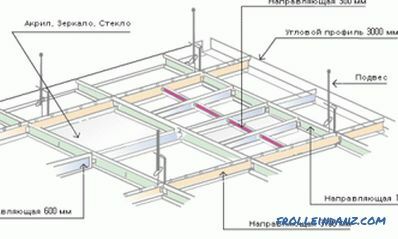 Now it is necessary to install the transverse beams on the uprights and on the supports fixed to the wall. In the place where the crossbeam is connected to the stand, use metal corners. Next, you need to build a crate. 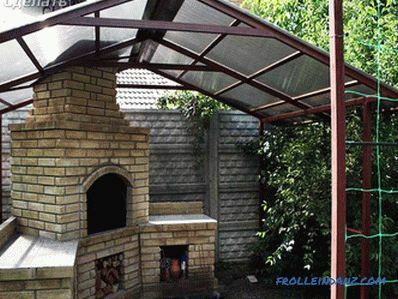 When the frame is ready, it is necessary to fasten the polycarbonate with self-tapping screws with thermal washers. This simple instruction confirms the words spoken at the beginning of this article. 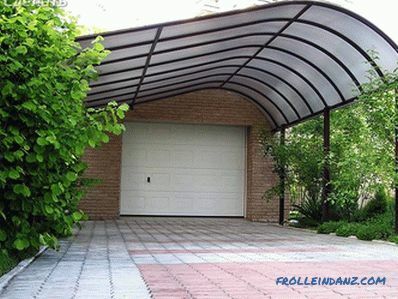 Even without special construction skills, you can if you want to do all the work on making a canopy yourself. If you have personal experience in such construction, then leave your comments at the end of this article.